"Ladies and Gentleman, as you can all see, the weather outside is very bad right now. I would like to suggest that we continue to wait a bit before trying to take off". WHAT? It was almost like a question! I was surprised when he didn't come back on and said something like "We will now be taking a poll to see who wants to take off now and who would prefer to wait"!!! It was a little disturbing but OBVIOUSLY we had to wait. For another hour! UGH. 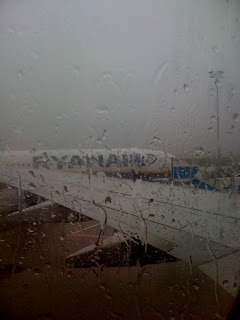 Once we were able to take off the flight was pretty bumpy all the way to London-Stanstead. I was not sorry to get off the plane. Customs didn't take nearly as long this time as it did last time and I was happy about that. Deaner and I made our way to Avis Car Rental and were pleasantly surprised that we were giving a 2010 brand spanking new VW Passat as our rental car! Geez! High style! We even managed to get to Lakenheath without Deaner killing us! I was a little apprehensive to say the least about his left hand side of the road driving skills! I only had to tell him a few times that he was about to ram the side of the road with his tires on the passenger side. I'd say that it was very successful. Last time we were in Lakenheath our room left a lot to be desired. I was feeling very lucky that our room in Wiesbaden was so much nicer. Now, I am ticked about our room in Wiesbaden. Apparently last time we were in the oldest most decrepit building left at the "Liberty Lodge Lakenheath" and this time we are living in luxury! We have a "family suite" and it is great. Again, I'm quite aware that this is no Ritz Carlton but for military lodging it is great. We are in a 3 room suite with a full kitchen, living room, bedroom, and bathroom complete with double sinks! I took some pictures of course! SO, luckily Deaner didn't have to work yesterday. We got checked into the hotel, went to the gym (also got stuck in a bad HAIL storm), and then headed to our favorite restaurant here, The Plough Inn. I remembered my camera this time and actually took a picture. The food here is SO good. I had a steak and the best mushrooms I have ever eaten. On the way home from dinner we stopped at the Shopette to get some drinks for the room. I saw this car and could not stop laughing. Deaner said that if I am not on my best behavior that this is the car he might buy for me while we are in Germany! You aren't seeing things incorrectly! It only has THREE WHEELS!! Who has ever heard of such a thing!?! Anyways, now Deaner just walked through the door and we are going to run and get lunch. Then we will decide what to do with the rest of our day! I think that a trip to Cambridge might be in order! I'll keep everyone posted. Don't forget to read my TWO other posts from today. It feels good to be caught up!! OMG I am terrified of flying so I probably would have peed my pants if I was in a plane and the pilot said that!!! That room looks great! Very nice for Europe! From that picture on the plane there would have been no way I could have stayed on that plane!!! Come on...You know you want to go for a ride in that car! Just kidding! I thought I had seen some crazy cars but that takes the cake! And thank goodness my hubby was not on the plane...he is Terrified of turbulence/lightning/storms while flying. In fact, he held my hand so tightly on the return flight on our honeymoon that I my fingers turned white! Sarah, can I just say that you really make me laugh? I laughed all through this post. I am so jealous of all your adventures!